To study the impact of hormone receptor (HR)- and human epidermal growth factor receptor 2 (HER2)-defined subtypes on survival of inflammatory breast cancer (IBC), and to determine whether sensitivity to neoadjuvant chemotherapy (NAC) varies with subtypes in a large IBC population. We analyzed 593 IBCs with known HR/HER2 statuses between 2010 and 2011 from National Cancer Database. We compared pathologic complete response (pCR) rates among four molecular subtypes by Chi-square test. 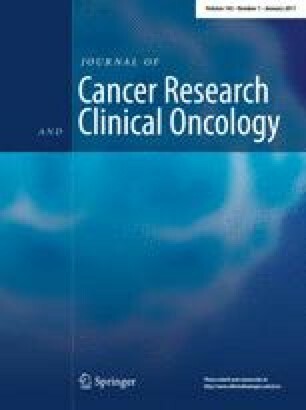 Overall survival (OS) was compared among four subtypes and patients with or without pCR using log-rank test. Multivariate Cox model was performed to identify the impact of molecular subtype and other prognostic factors on OS. Of the 593 patients included, 231 (39.0 %) patients had HR+/HER2− tumors, 98 (16.5 %) had HR+/HER2+ disease, 112 (18.9 %) were HR-/HER2 + patients, and 152 (25.6 %) had triple-negative subtype. The pCR rates differed significantly by subtype (P < 0.001): HR−/HER2+ showed the highest, and HR+/HER2− exhibited the lowest. Multivariate analysis showed that triple-negative and HR+/HER2− IBCs had significantly worse survival compared with HR+/HER2+ or HR−/HER2+ subtype (P < 0.01 for all comparisons). Additional factors associated with worse OS included more comorbidities, lack or incomplete surgical resection, absence of radiotherapy, lack of hormone therapy, and more advanced stage. IBC is an aggressive heterogeneous disease with distinct molecular subtypes associated with differential outcomes and sensitivities to NAC. Unlike in noninflammatory breast cancer, in IBC HR + disease was not associated with favorable prognosis. Triple-negative and HR+/HER2− subtypes are independent predictors for suboptimal OS in IBC. Jieqiong Liu and Kai Chen contributed equally to this study. The online version of this article (doi: 10.1007/s00432-016-2281-6) contains supplementary material, which is available to authorized users. The data used in the study were derived from a de-identified NCDB file. The American College of Surgeons and the Commission on Cancer have not verified and are not responsible for the analytic or statistical methodology used or the conclusions drawn from these data by the investigator. We thank Professor Na You for helpful statistical discussion of this work. This study was supported by Grant from the Natural Science Foundation of Guangdong Province (No.2014A030310507); Grant 163 from Key Laboratory of Malignant Tumor Molecular Mechanism and Translational Medicine of Guangzhou Bureau of Science and Information Technology; Grant KLB09001 from the Key Laboratory of Malignant Tumor Gene Regulation and Target Therapy of Guangdong Higher Education Institutes; and Grant from Guangdong Science and Technology Department (2015B050501004). Data within the NCDB were rendered anonymous, so this study was exempt from reviews by the Johns Hopkins Medicine and Sun Yat-sen Memorial Hospital Institutional Review Board, and no informed consent was needed in this study.